Once upon a time there was a prince who wanted to marry a princess. but she would have to be a real princess. He travelled all over the world to find one, but nowhere could he get what he wanted. There were princesses enough, but it was difficult to find out whether they were real ones. There was always something about them that was not as it should be. So he came home again and was sad, for he would have liked very much to have a real princess. 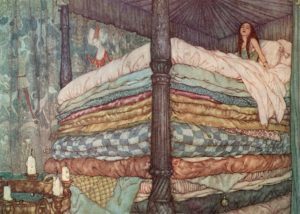 So the prince took her for his wife, for now he knew that he had a real princess , and the pea was put in the museum, where it may still be seen, if no one has stolen it.